The registration is open for the Ride and the barbecue is only $20 (12 and under are free) for family that wish to join the bikers in Manchester. Boston Bruin enforcer and biker Lyndon Byers will be the emcee for the Rider Appreciation Party. There will be family activities and the public is invited! The dual role of raising awareness of veteran issues and funding for the Home Base program makes this an easy sell! Tracy said providing awareness that Active duty, Guard, Reserve, Retired military and veterans that have served are New England’s neighbors and friends is a component of their outreach. With a public that has little contact with military personnel the Ride provides a focus on the military community. You can also provide a gift for the foundations if you want to contribute to this effort to support our New England veterans. Dirico Bike to be raffled! So have I convinced you to mount up on your bike or family vehicle and head to Manchester on September 24th? Celebrate our heroes service and support efforts to aid those with traumatic brain injury or combat induced stress. Is your bike ready to hit the streets and roadways of New England starting in six locations and ending in one? 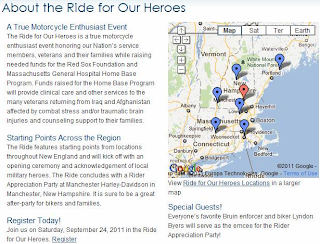 To register or find out more information please go to Ride for Our Heroes. The page also offers opportunities to volunteer for the Ride, Donate, Support a Rider and enter the raffle. Home Base is also on Facebook and twitter! Tracy and I also talked about the Home Base Program but I want to provide a focus on their efforts to help our veterans and their families in the near future so I will do a separate blog for this fantastic, free for veterans and veterans’ families program! Yes, it is completely free!